Within two months from enrollment, research trainees must submit a detailed work programme which includes a timeline of the activities they plan to carry out for the whole duration of the European/International Joint PhD programme (3 years). This work programme will be regularly updated and will allow to better supervise and evaluate the research progresses made by the trainees. 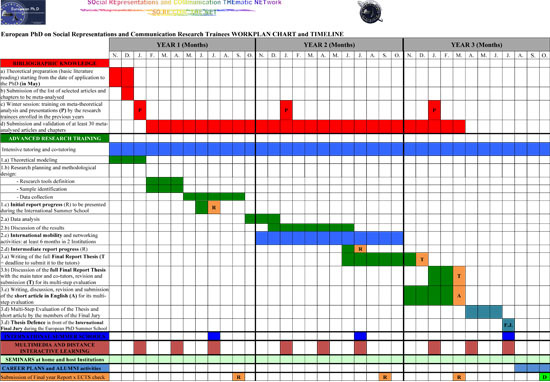 Below is an example of how an ideal workplan should be structured along a 3-year period, but of course each research trainee - in agreement with his/her main supervisors and two co-tutors - is free to draw up his personal plan of activities (exclusively for the section "Advanced research training") based on investigation need.